Up to 67% of patients admitted to the hospital have unintended medication discrepancies, and these discrepancies are also common at discharge (1). 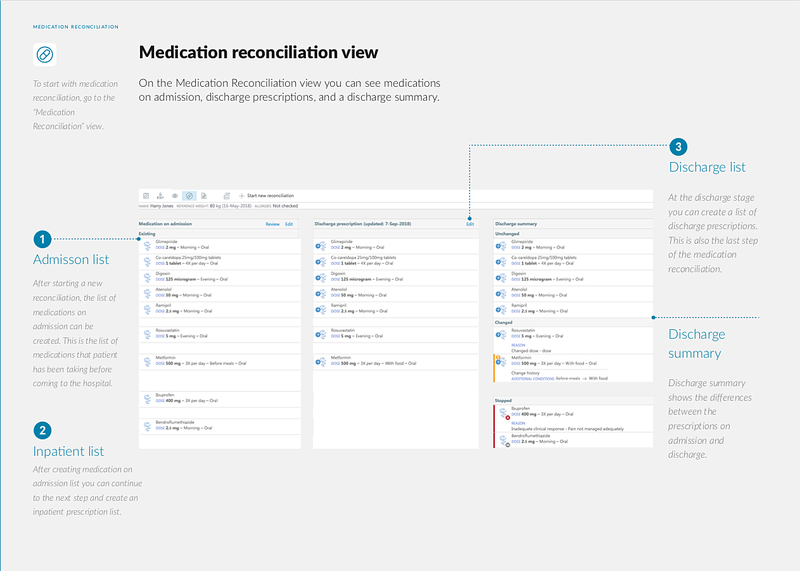 Medication reconciliation at admission, during a patient’s stay, and at discharge are the first steps towards accurate and informed decision making for patient care. 1. Why is medication review and reconciliation challenging in the first place? If you ask patients about their therapy, they might reply that they are taking pink pills or white pills. Sometimes they will actually know the name of a drug, but not necessarily the dosage. While this discussion with patients is still important, clinical pharmacists need a more reliable source of information to accurately compile a patient’s drug history in the hospital. Leo Martin-Scott, the Lead Pharmacist for electronic prescribing and medication management (ePMA) at Taunton and Somerset NHS Foundation Trust, explains that in the NHS, when conducting medication reconciliation upon admission, clinical pharmacists need to go through several steps, starting with talking to patients about any medication they have brought with them. "This provides information about what they are actually taking, rather than just what their GP has prescribed for them. It also helps identify any other medications they are taking which were not prescribed, such as over-the-counter products. It is always important to first check with patients and see what they are actually taking, and if they are not be taking their medications as prescribed by their doctor. To confirm what a patient has said, and to ensure that no medications are missing, it is also important to be able to access a patient’s GP record. This can be done through direct contact with the GP surgery, or via a number of electronic services that may exist, such as a patient’s NHS Summary Care Record. In some cases, it may be necessary to call a patient’s particular pharmacy. By combining these various sources of information, we can create a complete list of a patient’s therapy," says Martin-Scott. Hospital clinical pharmacists aim to complete medication reconciliation for patients within 24 hours of a clinical pharmacy service being available. Countries differ in terms of accessibility to patient information. Nonetheless, it holds true for all medical institutions that when all medication related sources are exhausted, and objectives for an optimal medication review are fulfilled, then therapy can be optimised, medication-related problems minimised, and waste reduced. According to a systemic review in Annals of Internal Medicine published in 2013, up to 67% of patients admitted to the hospital have unintended medication discrepancies, and these discrepancies remain common at discharge. As in other areas of patient safety, errors are more common than actual harm. Reported proportions of unintended discrepancies with the potential for harm range from 11% to 59% of all discrepancies (1). The most commonly referred to problem regarding medication reconciliation is the omission of drugs that the patient is taking. 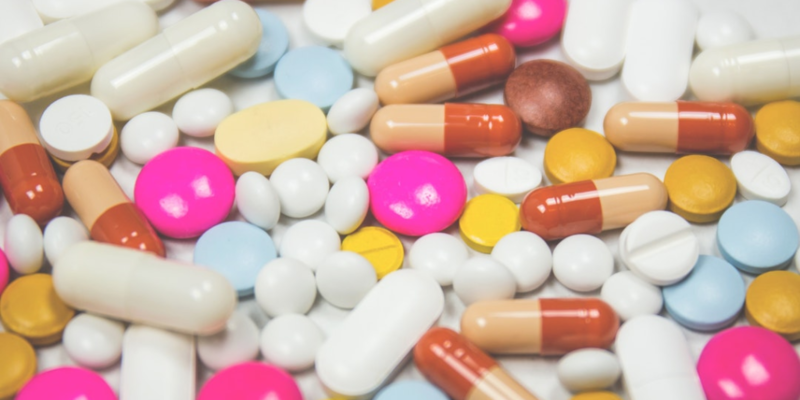 Prescribing errors in the UK occur in 1.5-9.2% of medication orders written for hospital inpatients, according to the NHS Connecting for Health (NHS CFH) report (2). With the proper involvement of clinical pharmacists, and their attention at each step of the reconciliation process, errors can be corrected before they reach the patient. As was shown in many examples in our webinar with Duncan Cripps, Lead Pharmacist for e-prescribing system implementation at University Hospitals Plymouth NHS Trust, handwritten prescriptions cause serious medical errors such as wrong dosages, mismatching of medicines, or the prescription of non-existent drugs. Paper-based medication reconciliation also causes several inefficiencies. For example, if the prescription is illegible, it takes time for pharmacists to check what the prescribing doctor intended. Pharmacists could save even more time if it were possible to do the reconciliation remotely, instead of having to check patient prescriptions physically by visiting each ward under their charge. Most NHS Trusts currently have paper-based reconciliation processes in place, but in a few years this could change. In 2018, the UK Department of Health and Social Care announced a fund of 75 million pounds to help Trusts put in place state-of-the-art electronic systems. In his recent talk at the Exponential Medicine Conference, Vinod Khosla, a renowned digital health and biomedical technologies investor, criticised that too often the quality of a patient’s care depends on the doctor. The reality in healthcare is that processes and resources differ in different institutions and different countries, not to mention from doctor to doctor. In 2016, the WHO released the second edition of the Patient Safety Assessment Manual (4). 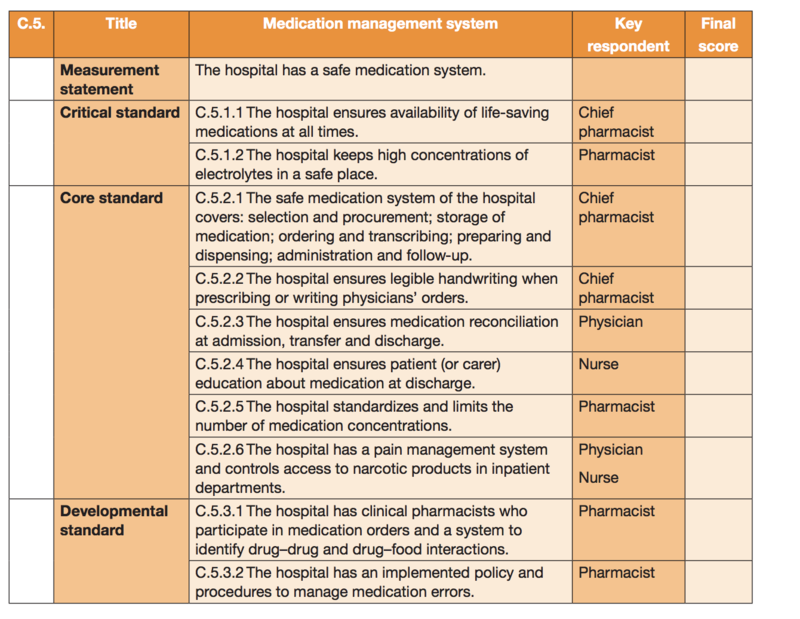 The manual includes outlined standards for the best possible medication management systems. Hospitals should ensure medication reconciliation at every step of a patient’s hospital journey (admission, stay, discharge), involve clinical pharmacists in the medication prescribing and ordering processes, and have a policy in place for medication related errors, recording, and management. Clinical reality and safety measurements vary from hospital to hospital. Despite technological progress, digital health inventions, discussions about artificial intelligence, and blockchain, many hospitals still use paper to manage care and face numerous medical errors due to the illegible handwriting of prescriptions and charts. Digitised medication reconciliation and good electronic prescribing and medication management systems are the first step towards improved medication management for clinical workers. The next big step in care and process improvement will come as a result of the connectivity between all of the systems patients interact with in the course of their journey through the healthcare system. When a combined overview of data from various systems exists, new opportunities for higher levels of care will arise as well. Various medication-related decision support systems are either being used in practice already, or are currently in development (5). 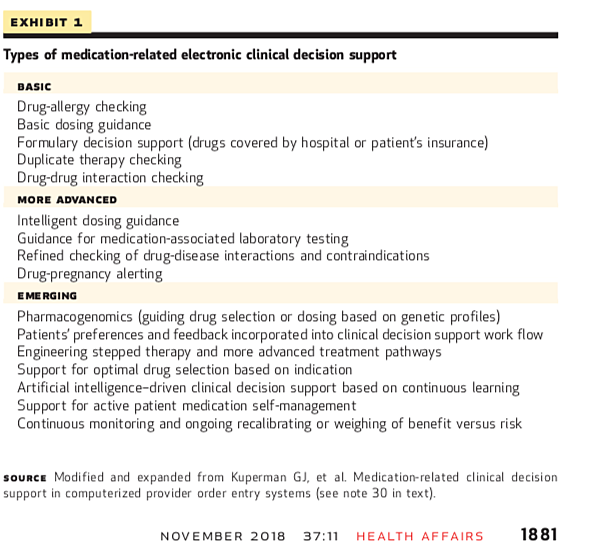 This includes intelligent dosing, allergy checks, drug-disease interactions, pharmacogenomics, continuous monitoring, the ongoing recalibration of weighing of benefits versus risks, and more (see the table below). Successful medication reconciliation is resource-intensive: it is time-consuming, requires multidisciplinary collaboration, and imposes a cognitive burden on clinicians which could be relieved by the use of technology (3). Advances in data gathering and the rise of new decision-support systems, which are based on reviews of clinical trials and genomics discoveries, are moving medicine and medication prescribing towards a truly personalised medicine approach. Eventually, these things will be integrated with ePMA systems. Marand’s OPENeP already offers automatic maximum dosing for specific critical drugs based on the British National Formulary (the unrivalled guide on prescribing, dispensing, and administering medicines), and offers integration with the First Databank Clinical Drug Information decision-support system. Designed in cooperation with top UK Pharmacists, it provides a comprehensive overview of patients’ medication history upon admission, during their stay, and at discharge, with highlighting for medicines that have been changed or stopped (see the picture above). Schiff et al. (2018): A Prescription For Enhancing Electronic Prescribing Safety. Health Affairs 37, NO. 11 (2018): 1877–1883, Project HOPE - The People-to-People Health Foundation, Inc.